Задача: In 2014, the creators of the famous brandy ArArAt decided to hold a unique gala dinner and give the floor to their master blenders, to share their moments of inspiration and passion, revealing the essence of the legendary Armenian cognac from a number of large screens. As conceived by the design group, through the use of multimedia projectors, the arena of the First Cadet Corps in Historic St. Petersburg was to be turned into a cultural multimedia space for the premiere of the ‘Ararat. Revelations.’ event. Решение: The Optoma ProScene W501 projector was selected for the installation. The exhibition made an incredible impression thanks to the unique approach to project implementation and the clear, bright (5,000 lumens) images. A distinctive feature of the DLP projection technology is its precise imaging, colour saturation and longevity, which made the ProScene W501 an ideal solution for the creators of this ambitious event. 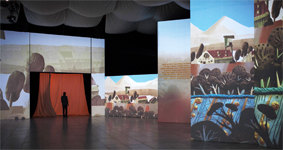 Fifteen W501’s were used to fill the space with unique and authentic multimedia content through projection. Результаты: As planned, the premiere of the Ararat. Revelations. event took place in the arena of the First Cadet Corps in St. Petersburg. The impressive visual impact helped participants of the unique gala dinner to become immersed in the atmosphere, get to know the master blenders’ stories, and of course, enjoy the taste of the legendary brandy. 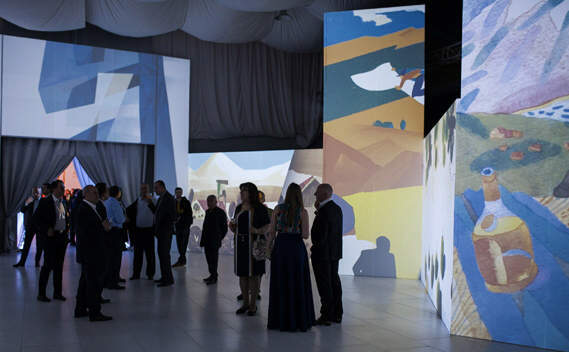 Thanks to an innovative approach to content projection, the guests were able to immerse themselves in the world of ArArAt, discovering secrets and subtleties of creating this noble beverage.